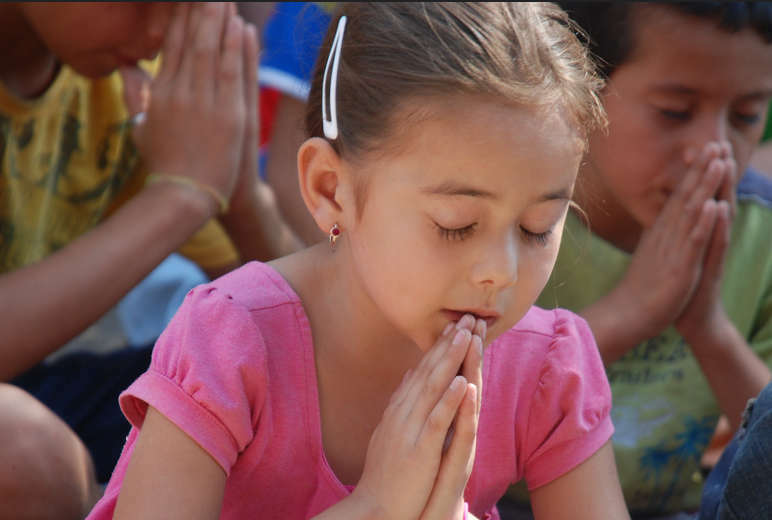 The most important thing we can teach our children is to seek God in prayer. Before any school starts each day, let your children see you praying. Be a living example of prayer. That is the best way to teach them to pray. Here are 16 short prayers for homeschooling families. Use them, trust in them, and repeat! Lord, open my spiritual eyes so that I can see you in hectic, busy homeschooling days. Show me ordinary miracles, and help me to see that you show up when we invite you in. Give me patience for wiggly worms, cranky attitudes, and persistent dawdlers. Help me to remember that a love of learning is more important than a worksheet completed neatly and in a timely manner. Lord, help me to seek first your kingdom in our homeschool. Let my eyes be fixed on what’s eternal, rather than what is fleeting. Dear Jesus, show me how you designed my children, with their unique gifts and talents. Guide me in ways to build on those strengths, instead of trying to fit my children into a curriculum’s mold. Unite our family on this homeschooling journey. May our time together build bonds that will last a lifetime. Open my eyes to the books and resources that will help to expand our knowledge of you and your world. Dear Jesus, bring homeschooling friends into our lives who we can bless and who can be a blessing to our family. Help me guide my children in physical wellness and healthy living. I know that focusing on knowledge is not enough. Help us to build healthy bodies, too. Lord, may my first response during tense or overwhelming days be to turn to you in prayer, realizing that I don’t have to face the day alone. Help us to face disappointments well, for I know that character is built when we deal with things that go wrong even more than when they go right. Dear Jesus, bless our finances. Show us ways to do more with less, so that we can be faithful examples to our children. Lord, let me not be overwhelmed with all the daily tasks. Fill my heart with joy as I clean, cook, and serve. Help me, Jesus, to set safe boundaries for my children. Show me how to shelter them when I need to but also teach them how to deal with the world’s struggles while they are still safe in my care. Help me to smile more than I frown and offer encouragement more than I complain. No one is perfect, but may your spirit in me change my attitude for the better. Finally, Lord, remind me that the prayers that always go unanswered are the ones I never pray. Help me to turn to you first and often. Amen. Now it’s your turn. What do you pray for your homeschooling day?